Barely out of the car, Annie is panting in the hot sun at Washington-on-the-Brazos State Park. These were some of the few bluebonnets we encountered. 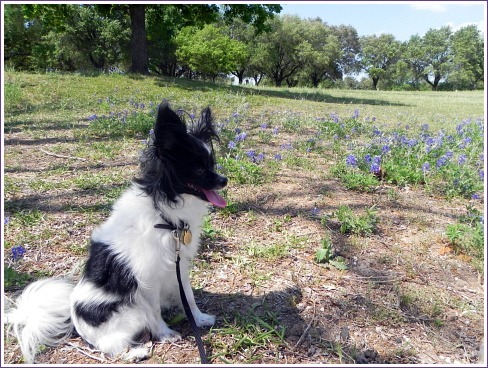 Having finally accomplished the long-put-off doing of my income taxes before noontime, and with the yard and garden work already finished for the weekend, I coaxed Annie into the car and off we headed out 290 in quest of bluebonnets. Without seeing a glimpse of a bluebonnet, we drove as far as the quaint, old town of Chappell Hill and turned onto a side road. This asphalt lane, like so many other roads in the Texas Hill Country, seems to be filled with natural beauty and history. It never ceases to amaze me how on one piece of land you’ll see a humble dwelling that probably was once a share-cropper’s house, and then, not even a quarter mile down the road, a 6 or 7 figure “swankienda” stretches out into the acreage. But these, along with the green meadows and wooded creeks, make for a drive that forces you to go at a speed slower than that of Granny going to church. After about 50 miles of driving, a small, hillside field showed off its indigo glory, but the cars and motorcycles that were already stopped left no place to pull over and try to take pictures of a small dog romping amongst the bluebonnets. Brazos State Park. It’s really a wonderful place, not too overdone with the history part. There’s a museum and a visitors center, but there are also places to picnic and lots of trails to walk and discover the history as well as nature’s beauty. With a 92-degree south wind pushing at us, a maybe mile-long walk was about enough to do in a guy and a little dog. I’d brought water for her, which she lapped up when we got back to the car, but after getting the AC going, I began looking for a convenience store to find a cold drink for myself. We did find some bluebonnets in the park, but either it’s still a bit early or the drought has caused the bluebonnets to suffer this year. Whatever. We had a good day on our quest, finding more than the flowers. Independence Hall, the site of the signing of the Texas Declaration of Independence. This looks like a replica to me; maybe some of the boards are original. Some of the flowering plants growing along the pathways. 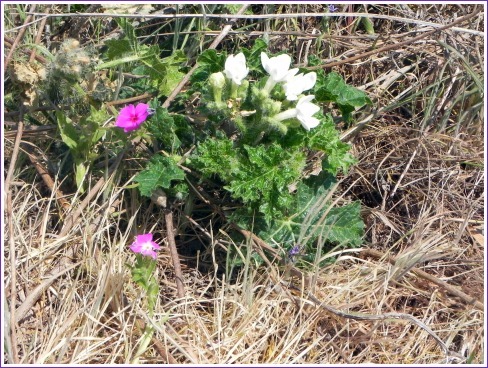 The pinkish-purple appears to be a native verbena. The white blossoms on the other plant were pretty, but the stem looked very prickly. 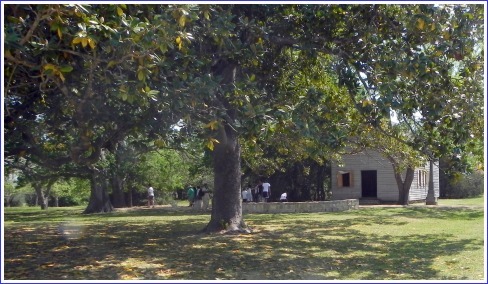 The park has many trails to wander, some along the Brazos River. Here and there, youll find informational signage, telling about the history of the site, but these signs do not interfere with just enjoying the tranquillity of the area. 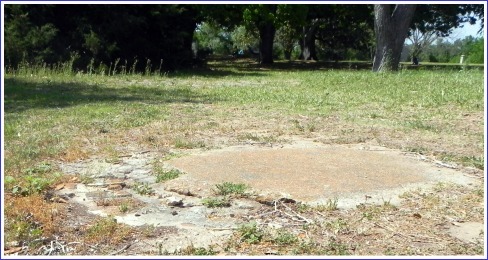 Pieces of history, like this old water well, are evident throughout the park, but because the park has not been "over-developed", the visitor can almost feel like he is discovering artifacts. Located outside of the state park, current-day Washington, Texas holds hardly more than some kind of eatery and a post office.